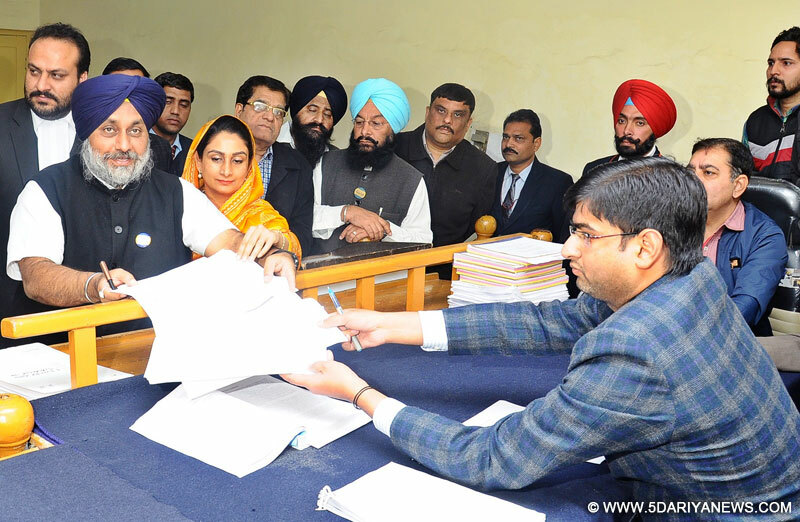 Shiromani Akali Dal (SAD) president Sukhbir Singh Badal today said the Aam Aadmi Party (AAP) was in alliance with radical organizations and that the recent incidents aimed at inciting violence in Jalalabad and Lambi were part of a conspiracy hatched between AAP and radical elements.Talking to newsman after filing his nomination papers along with Union food processing minister Harsimrat Kaur Badal who has filed her nomination as a covering candidate for Mr Badal, the SAD President said the recent disturbances in Punjab had occurred shortly after AAP Convenor Arvind Kejriwal held meetings with radical elements recently.Giving details, Mr Badal said Kejriwal had recently held meetings with the three self-styled “jathedars” supported by radical elements besides radical ideologue Mokhan Singh. The latter heads the United Akali Dal (UAD), a separatist body which has earlier also tried to incite violence in Punjab. He said Kejriwal also held a breakfast meeting with Babbar Khalsa International (BKI) frontal organization Akhand Kirtani Jatha spokesperson R P Singh three days back. “He has also met radical Sikh leader Amrik Singh Ajnala whose brother attacked CM Sahab yesterday. All this proves that the recent incidents of violence were part of a larger strategy to create trouble in Punjab. Mr Badal while answering a question said AAP had officially admitted that it was a party to instigating people to resort to violence. He said AAP leader Bhagwant Mann recently openly asked people to throw stones at the senior SAD leadership and even admitted this in a television interview. This has been brought to the notice of the Election Commission also, he said.Mr Badal said all these acts were the result of extreme frustration on the part of AAP. “The party realizes that the ground is slipping beneath its feet and that the people are rejecting its anti-Punjab agenda. It is because of this that the party is now resorting to such acts”, he added.Asking AAP not to test the patience of the SAD, Mr Badal said the akali cadre was quiet because it was peace loving and was committed to maintaining law and order. “The very fact that peace and communal harmony has reigned in Punjab for the last ten years is testimony of this. This peace was achieved with great difficultly after nearly two decades of turbulence. But now some forces have got together and are resorting to “goonda gardi. Our cadre believes in peace and harmony but can also defend themselves if instigated”, he added.